Great for Cellphones, Small Electronic Devices, Jewelry, Etc. 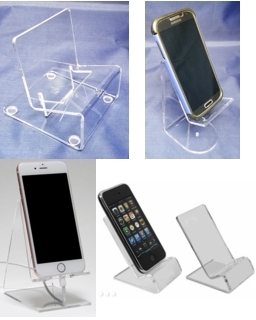 Our Clear Acrylic Cell Phone Easels Are Perfect for Holding and Displaying a Standard Cell Phone or Other Small Electronic Device. Our Acrylic and Styrene Cell Phone Easels Can Be Used to Hold Products Other Than Cellphones, Such As Small Boxed Items, Jewelry, etc. Hand Manufactured from Sturdy Crystal Clear Acrylic or Economical Clear Styrene, These Display Easels are Durable and are Built to Last. CPE1 2 3/4" 5 1/4" 4 3/4" 3/4"
CPE2 2 3/4" 4" 5" 1"
CPE3 2 3/4" 5 1/2" 3" 1"
CPE4 2 1/2" 5" 4 1/2" 1"
CPE6 2" 3" 2" 1/2"